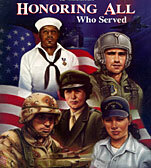 "Today, Americans are united in honoring the almost 27 million veterans of our country's Armed Forces. For generations, Americans of all backgrounds, from all across the country have answered the call to service. They and their families have made great sacrifices in defense of our freedoms, serving with honor and distinction. This year's commemoration, like others in recent years, takes on added significance, as our nation continues to ask so much of the brave men and women serving in Iraq and Afghanistan. They have answered the call, displaying great skill and courage, and demonstrating a commitment to American that makes us all proud. We are all deeply indebted to them, and the brave soldiers who have served before them. "This Veteran's Day follows the end of an historic election season. The American people sent a clear message for a new direction by electing strong Democratic veterans like Jim Webb in Virginia, Tim Walz in Minnesota, Phil Hare in Illinois and Admiral Joe Sestak , Patrick Murphy and Chris Carney in Pennsylvania to Congress. In doing so, they voted for hope and opportunity over fear and smear. They voted for change and accountability, not the White House's full- speed ahead commitment to a failed strategy in Iraq. And they voted to keep our promise to the brave men and women who have given so much in defense of our freedoms, asking only that their government keep its promise to take care of them when their service was done. "For too long, the Republican Congress and the Bush Administration have failed to keep that promise. When Democrats take control of Congress, we will offer America's veterans and military families a renewed commitment to fully fund veterans health care, expediting the processing of benefits claims, and providing affordable health insurance to thousands of members of the Guard and Reserve by providing them full TRICARE benefits. After giving so much in serving our nation, this is the least we can offer in return. "Democrats stand ready to lead. Together, we will make America stronger, and move America in a new direction-one that keeps our promise to the men and women who have served our nation."